The Church in Sierra Leone is a part of a global movement to invite all mankind to prepare for the defining visitation from the Throne of God. A visitation that will end the perils of life on this planet and restore man to the "image of the Creator". This visitation is personal and individual now and will be personal and individual when it occurs the second and third time. 1 Thess 4: 16-18 and Revelation 22 decribes the promise. Our work presently is the first personal individual invitation of John 14. In addition, the 7th day Adventist Church has accepted the mandle of the church of God of Revelation 14:6-12.
him. The Bible explains the nature of God and the way God’s followers will behave as a result of their relationship with him. The 10 Commandments function as a mirror to point out sins in the light of God’s Holiness. The Law is a condensed version of God’s Character manifested in the lives of the children of God. The Law is holy, just and good” and as eternal as the Creator. A Holy Spirit filled live will live in harmony with the precepts of the Ten Commandments. Faith means placing complete trust in God, and accepting his offer of salvation. Such trusting faith is fundamental to Adventist beliefs. A living relationship with God is essential to faith. The heart of the Adventist message is the gospel, God’s good news of salvation. Through Jesus’ death on the cross human beings may be won back to love and trust God, and accept God’s free gift of eternal life for all those who follow him. the Sabbath as a day of celebration and worship. while on earth, and Adventists follow his example in keeping the fourth of the Ten Commandments. come and worship him. Jesus observed the seventh-day Sabbath while on earth, and Adventists follow his example in keeping the fourth of the Ten Commandments. Adventists follow Jesus in identifying those who die as sleeping. Those who have trusted God are raised to life when Jesus returns, and look forward to a wonderful future--eternal life in God’s presence. 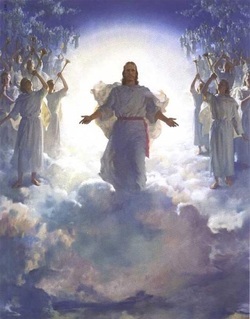 Adventists look forward to the soon return of Jesus Christ as prophesied and as he himself promised, but do not set any date for this glorious event when he comes to take home all who accept him as their Lord. Those who choose to accept God’s way for their lives and his offer of eternal life demonstrate their belief through baptism (being immersed in water), following the example of Jesus. Adventists follow lives of commitment to God and his plan for us, which include following his commands as being for our best good. The Republic of Sierra Leone, a former British colony, became an independent nation on Apirl 27, 1961. The country is located on the west coast of Africa and bounded by the Atlantic Ocean on the the west, Guinea on the North, and Liberia on the Southeast. The predominant religion is Islam with 10% of the population of 5 million professing Christianity. 70% of the population is illerate in English, the official language. Quality education, health care and housing is a major challenge for most of the population. Sierra Leone is rich in mineral, agricultural, marine and tourism resources but the wealth of these resources are not efficiently applied to effect a high quality of life for the majority of the citizens. Sierra Leone has rich cultural heritage and among the many local languages spoken, the common language of the people is Krio which an amalgamation of 16 languages. The name Sierra Leone dates back to 1462, when a Portuguese explorer sailed down the coast of West Africa. There seems some dispute whether it was the shape or climatic conditions that influenced Pedro da Cintra to come up with “Sierra Lyoa” meaning Lion Mountains. Some say the coastal regions looked like “lion’s teeth”. Others suggest he thought the thunderstorms over the mountainous peninsula sounded like the roar of a lion. Sixteenth century English sailors called it Sierra Leoa which evolved in the 17th Century to Sierra Leone. The British officially adopted the name Sierra Leone in 1787. In 1787, British philanthropists founded the “Province of Freedom” which later became Freetown, a British crown colony and the principal base for the suppression of the slave trade. The local name for Freetown before the Europeans came was “Romarong” meaning the place of the wailers. This name came from the sounds of the constant weeping and screaming of victims of storms and cross current disasters at the mouth of the Sierra LeoneRiver. is basically the home of the Krio group. There are two distinct seasons in Sierra Leone. November to April is the dry season and the best holiday weather. May to October is the wet (rainy) season. There is also the harmattan period of during the months of December to February when very dry winds arrive from the Sahara. Sierra Leone is located on the West Coast of Africa between latitudes 7 and 10 degrees North and longitudes 10.5 and 13 degrees west. The Republic of Guinea is to the north and Liberia is on East and North East, and the Atlantic Ocean on the west and south. It has 300 Miles of coastline. Whilst the Government of Sierra Leone is committed to meeting the eight Millennium Development Goal (MDG) targets, limited progress has been made. The most recent figures from the 2003/04 household survey found that 70% of the population lived below the national poverty line (£0.52p a day) and 26% of the population lived in extreme poverty. In the education sector significant improvements have been reported in the aftermath of the war, with recent figures from the Ministry of Education showing an increase in the number of children in primary schools rising to 1.28 million. However, despite this impressive progress, Sierra Leone is far from reaching the target of all primary aged children completing a full course of primary schooling by 2015, and more needs to be done to improve female participation, especially in rural areas.